This page includes GodotMedia.com reviews of users as well as an official review by ContentHeat in which we carefully analyze and write out our experience. When we first decided to write our Godot Media review, we couldn’t even imagine how tricky it would be to find out where the agency is from. Indeed, their website doesn’t say it — there’s nothing about it in their About Us page. However, after some digging, we discovered that they cater mostly to customers from India because that’s where they’re based. Still, Godot says on their website that they have clients in over 20 countries, so it’s safe to say that India is not the only one taking advantage of their semi-low prices. Right off the bat, we have to say that we loved how Godot’s website looked like. 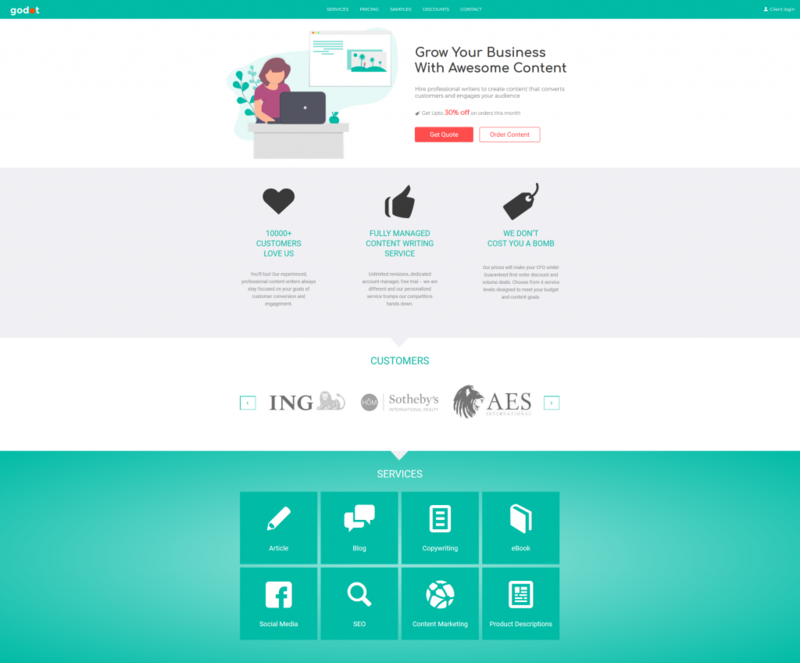 At first glance, it has everything a potential customer might be looking for: clearly stated pricing plans, a list of services they offer, a list of previous customers and even testimonials. However, all the glitz and the glam couldn’t fool us. We had to dig a little deeper in order to provide our readers with a useful Godot Media review. WHAT DOES GODOT’S WEBSITE OFFER? When it comes to testimonials, we were quite satisfied. Most websites just have a few “rave” reviews of their services, with only the name of the customer indicated. But Godot goes the extra mile and provides us with a name and a surname. They even say what the people do for a living, so it’s evident the testimonials are real. This was a good start in regard to our Godot Media review, as it showed some promise. 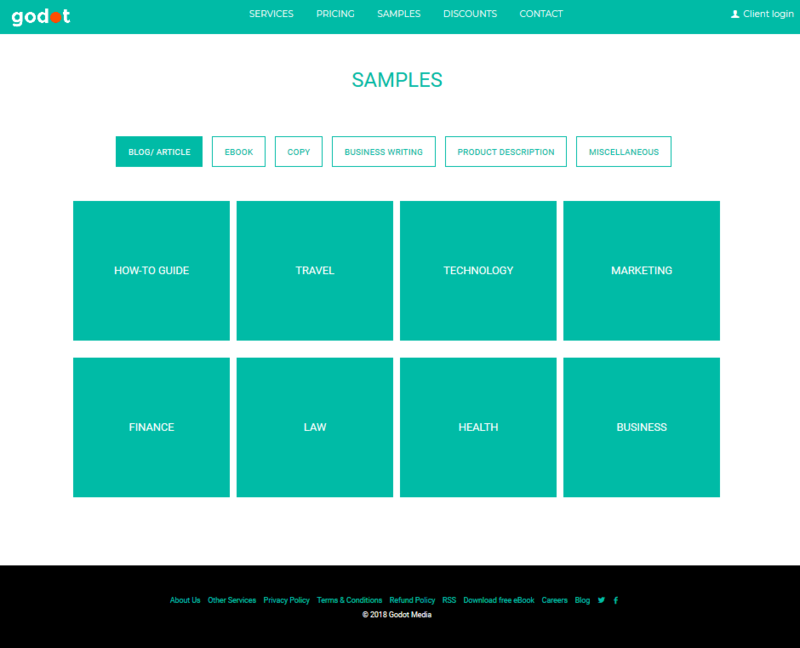 One thing that surprised us a bit is that they have some nice samples on their webpage. There are 28 of them, and they cover a range of topics: travel, technology, health, lifestyle, law, etc. 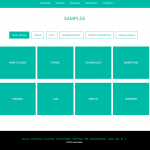 Moreover, they have samples from a few categories, such as blog posts and articles, as well as press releases, product descriptions, market reports and research papers. As stated above, we were glad to see that they haven’t concealed how much they charge for their services. Indeed, Godot has laid out everything perfectly, and there aren’t too many options, so it’s very user-friendly overall. Still, in order to get the right quote, with all the potential add-ons one may require, one would need to ask for it or to simply order content. Unlike some other content writing agencies, Godot is active both on Twitter and Facebook. What’s more, the last time they updated their LinkedIn page was about six months ago, so we could even say that they are semi-present there as well. Godot Media even has a blog on their website, which is a nice touch, to be honest. Although they don’t have any customer comments, the blog posts seem decent and interesting. 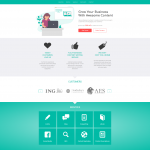 Another fantastic feature of their website is that they offer a free ebook on content marketing. All someone would have to do to get it is to give them their name, website, and email (the email part is the only mandatory field). However, most of the time, these ebooks are a ploy to create an email subscription list. Still, a free ebook never harmed anyone! Overall, this agency has a great website that looks reliable and professional. But what’s their content like, you may ask? Well, for the purposes of this Godot Media review, we had to find out. In order to give our Godot Media review the best shot, we decided to order one article, which we will elaborate on a bit later. However, we couldn’t actually register as a customer. The actual registration goes through the order form, which we filled in and sent. The semi-registration process is simple and fast, but that’s not great news at all. We found that it lacks in many details other content agencies have. There were only a few fields we could fill in, such as our name and project details. Other than that, there were no options for us to say that we want them to add a meta description or keywords, and use a specific voice. Moreover, they don’t have the “audience” or the “tone” options, which are important when dealing with SEO articles. In all fairness, one can add this sort of information in the description field. However, what if someone forgets to say more about the order? Having specific fields for such information is crucial, as Godot and the customers wouldn’t have to go back and forth emailing each other. The order details are key if we want to get the best content. We also couldn’t attach a document, which is a shame as it’s much easier to give someone instructions like that. Once we ordered our content, we had to wait a day to get a confirmation email. It wasn’t anything to write home about — just a standard message that told us they had received our order. Godot Media offers PayPal as a payment option, which is good news for all of us who love ordering our content that way. But there are other options as well; customers can also pay for their content with their credit cards. Still, one thing we should note here is that there are extra charges involved. Indeed, we paid via PayPal, and we had to pay a fee in the amount of 4% of the total order. Customers who want to pay with a credit card would have to pay the same transaction fee. The first thing we noticed on the website is that there is no chat through which we can contact a Godot representative right away. Thus, we couldn’t actually inquire about their services first. 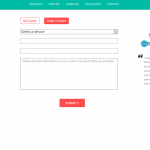 They only have a contact form, and with that form, we can either get a quote or order some content. However, when we got our order, we also received an email that belonged to our account manager. 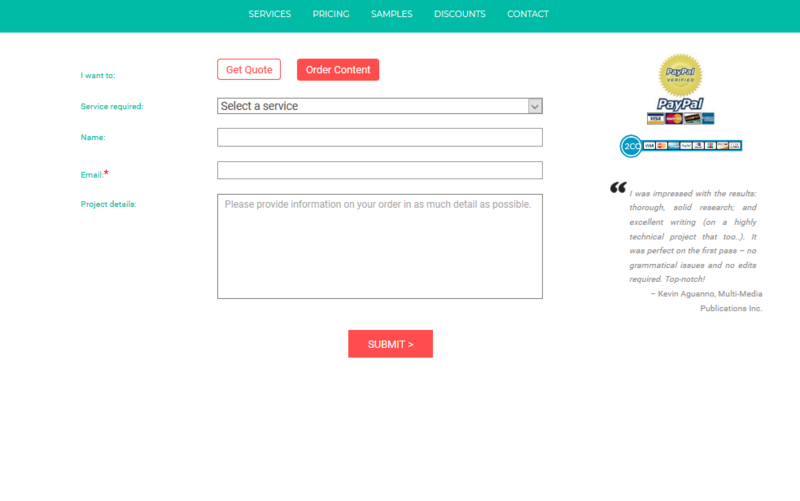 Godot said that we could contact that person if we had some questions or if we would like to place another order. 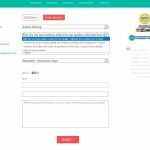 Revisions are an important part of any content writing service, so it was of the utmost importance to determine how many revisions we would get with our order. We found all the information we needed on their website in their Terms and Conditions. If someone orders content under the Basic option, they get no revisions at all. Meanwhile, for the Standard option, there’s one round of free revisions. The Premium and the Elite options are then everyone’s best bet. With the Premium, we get an unlimited amount of revisions if we make our requests within 14 days of content delivery. Similarly, the same goes for the Elite, but with that option, we have 30 days. Unfortunately, even though we tried, we couldn’t find anything about the writers. The only thing that partially describes who they are is the About Us page available on Godot’s website. There, Godot states that their team comprises of dedicated individuals with a vast knowledge of mass communication, literature, marketing, etc. Therefore, there’s really no evidence at all that could tell us whether their writers are native or near-native speakers. All we could do is judge the writers by the content we receive. However, it does seem like they have some in-house writers, although we are not sure. In any case, there are no photos of them, which could be a telltale that their writers are actually freelancers. When it comes to their refund policy, Godot is fair. They will only grant refunds if a writer hasn’t yet started doing the order or if someone requests it within seven days after the payment. However, if the writer is already working on the order and we haven’t made a request, then we cannot get a refund. We can only get revisions according to the type of option we picked. Finally, we looked into what else Godot Media has to offer, apart from content writing services. They have a special page called “Other services” on their website where they’ve listed everything else they do. At Godot Media, we can also get translating services from a variety of languages: Italian, German, Spanish, French and Japanese. Moreover, they state that they can do other languages as well. Everything else on that list is not that surprising. Most content writing agencies offer ghostwriting services, and they also do whitepapers and travel content. So, in essence, the translation services are the only “Easter egg” here. This option belongs to their best writers and will provide the customer with fully edited, top-quality content. Written by their senior writers, Premium content will also be edited and reviewed before delivery. Even though this option offers only one round of free revisions, the writers usually have years of experience in the wanted niche. So it’s still not that bad, but also not the greatest option they offer. Written by junior writers who probably aren’t as experienced as customers would like them to be, this is the cheapest option at Godot Media. With each order, the customers can pick between three TAT options: four, two and one business day(s). However, you should note here that the fast options (two business days — Quick, and one business day — Lightning) have a surcharge of 15% and 30% respectively. Godot’s main page offers a pricing list of some types of content they offer. 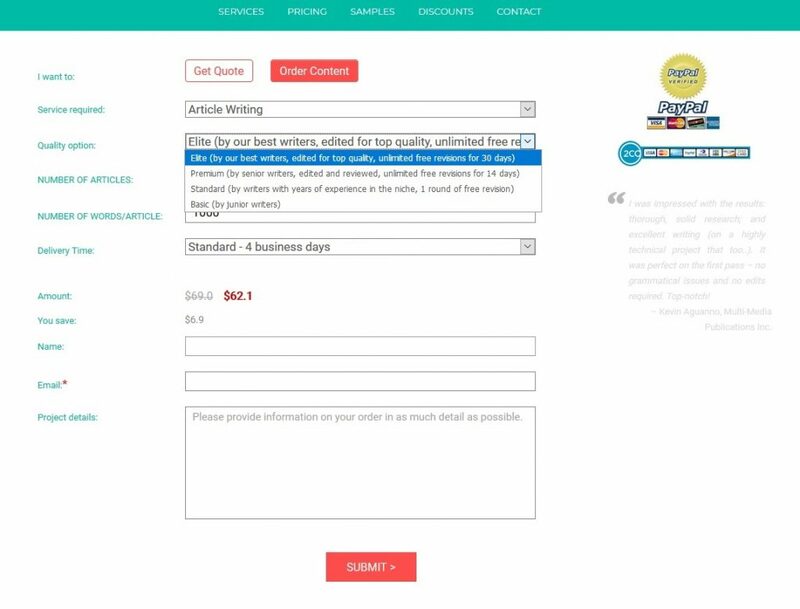 In order to get an accurate price, you would need to go to their order form and just select a few options (you wouldn’t have to order right away). Whitepaper writing — from $50 per page. There is about a $20 difference between the Elite and the Premium options for what we had in mind, so for our Godot Media review, we decided to go for the Premium one since a senior writer would write the content. We figured they would know how to handle our topic better than junior writers purely because of the experience they have. We ordered a 1000-word SEO article and added the keyword they should use. Since there weren’t any options regarding the meta description, preferred voice, etc., we didn’t say anything about that. However, we did say that the article should be informative and filled with details, but not too complicated to read. Moreover, it was of the utmost importance that it’s SEO optimized. We sent our order, paid for it and waited for the confirmation email, which arrived, as we’ve already mentioned, the next day. Nevertheless, we need to note one thing here: once we sent out the order, we couldn’t go back to the merchant page. So we couldn’t really check immediately whether we had forgotten to add something to our order. Since we automatically registered on their website when we placed the order, we could now see the progress. It said “working” until the order came, and on that same page, we could easily contact them at any given time by clicking the “Contact Us” button. We could also place another order immediately. We received our order in four business days, so that’s a huge plus for Godot Media. They delivered the content via an automated email. Apart from our account manager’s email, we also got a new email where we could send our feedback to the writers. The first thing we noticed was the fact that they had kept the topic we asked for as the title. Now, there’s nothing wrong with this per se, but we figured they knew that they could change this to accommodate the keyword better. In any case, they didn’t, so we were a bit disappointed immediately. In terms of the keyword density, our disappointment grew even more. The requested keyword showed up once in the whole text, even though it was logical to use it more than once in order to get the text properly SEO optimized. Finally, another thing we noticed is that overall, the article was a bit difficult to read. They didn’t really care about the Flesch score (we checked the article on Yoast), so they probably didn’t even notice that it was way too low for the online world. As such, it didn’t read well, and the flow was, in most cases, quite off. In terms of grammar, we cannot complain a lot, although we did find two spelling and one grammar mistake. The grammar mistake concerned the subject-verb agreement, while the first spelling mistake referred to a verb. The spelling mistake completely changed the meaning of the sentence, so that’s a big no-no from us. The second spelling mistake referred to the writer’s use of hyphens. At one point, they spelled the word correctly, but they then misspelled it a bit later in the text. That also speaks volumes about the lack of consistency this article had, as we later discovered that the writer couldn’t really decide whether they wanted to use numbers or spelled-out versions of percentages. Overall, the amount of research the writer did wasn’t that bad. However, we did expect a bit more from Premium content. Sure, the topic was not that complex, and there were probably dozens of similar articles online. But did they have to use the same old advice everyone gives? Couldn’t have they put in a bit more effort? The worst part was actually the fact that they didn’t explain some things they had said. They used terms like “long-term keywords” without actually telling the reader what they were or how to use them. In essence, they gave advice but no instructions whatsoever. And to be honest, there were enough words for those explanations. After all, SEO isn’t rocket science. On a more positive note, we didn’t really mind the sentence structure. However, in some cases, it seemed like the writer was trying way too hard to just SOUND knowledgeable. The sentences had little to no substance at all — they were just stating some facts here and there, not to mention bombarding us with statistics. They did add a source to the statistics, which was a nice touch. Nevertheless, the website that the writer left as a source was another article that had used those statistics. So in essence, we would have had to look for the statistics ourselves and link each one to the case study or survey it belonged to. The article passed Copyscape and was seemingly unique. However, once we delved a bit further into the matter, we realized that they didn’t actually say anything we hadn’t already known. Moreover, any reader out there would have probably just opted out of reading this sort of content, as it was a bit plain and didn’t say anything new. To be perfectly honest, we didn’t give a lot of instructions. All we said was that the content should be SEO optimized and that the language shouldn’t be too complicated. We gave them the topic and the keywords, as well as the freedom to be as creative as they wanted to be. Moreover, we added that they could use bullet points, which they did. But instead of acing our Godot Media review, they failed on Yoast, although it could have been a lot worse than this. The Flesch score was low, and the keyword density was practically non-existent. As such, they didn’t follow the instructions as they should have, even though there were only a few of them. Another thing we should note here is that the text wasn’t structured properly. There were paragraphs, titles, and subheadings, but they didn’t format the text, i.e., use H1, H2, etc. So from the SEO point of view, that’s a huge mistake, as we wouldn’t have been able to rank any website with this sort of text. We all know how search engines love their headings, so not having this makes Godot Media seem unreliable and a bit like hiring an amateur. In terms of quality of service and speed, we cannot say that Godot has left us wanting for more. Sure, we got our confirmation email a day later, which was perfectly fine. But during those four days, we didn’t actually know anything about our order. Yet we did receive the order as per the TAT we paid for. So that’s a plus for them, although we weren’t really satisfied with the order. After all, if this is the content they take four days to produce, then we really don’t want to know what they can do in just one business day. Overall, Godot Media is not bad, but it’s not great either. The content itself isn’t breathtaking nor does it have the SEO quality we were looking for. Moreover, we paid way too much for this kind of content, and we didn’t even get what we asked for. It is not useful as it is, and it would have to be improved in more ways than one. We would have to add the sources, more useful, unique content, as well as fix the mistakes and make the whole article engaging. Furthermore, we would have to format it correctly and add the keywords as naturally as possible. Many of you already know that adding keywords at the very end can spell a disaster. They have to be added during the writing process in order to feel and look natural. So in the end, we would have to probably rewrite the whole thing. This sort of content leaves us wondering whether the Elite option is a better choice. However, one would argue that senior writers should have the necessary experience to deliver top-notch content. Unfortunately, that just wasn’t the case with Godot Media. What’s more, some of the advice they gave in the article wasn’t really correct. They mentioned that people would need to use engaging, complex images in their content in order to improve their SEO. However, that’s just blatantly incorrect. The images can be simple — but they have to be optimized, which is a whole different story. We’re not sure if the writer misinterpreted some things while doing research, but they should have checked the facts either way. In any case, the rest of the article, and especially the advice portions, were not explained well. As such, no reader would actually learn anything from it. In our opinion, that is one of the main goals, apart from driving traffic, gaining revenue, etc., of anyone wanting to put this up on a content website. In our opinion, Godot Media is probably a good choice for someone who doesn’t really care whether or not the content is readable. Moreover, it’s for those people who don’t understand SEO at all. Godot Media claims they can do SEO articles, but this just proves that either their team isn’t that experienced at all or that we received a junior writer instead of a senior one. The Punctualist — we received our content on time. The Hard of Hearing — they didn’t follow the instructions even though we had only a few of them to offer. The main point was for the article to be SEO optimized, and they failed at that. The Jenius — that one spelling mistake shouldn’t have happened, at least not when it comes to Premium content. It completely changed the meaning of the sentence, so a reader who doesn’t know much about SEO would have just taken it as correct without thinking about it twice. That’s the way bad information travels online, and we certainly wouldn’t want to be the ones who pass on such information onto others. The Common-Knowledge Advisor — this article didn’t add to the topic at all; it just sort of summarized everything else found online about the subject. It wasn’t a difficult topic, and they could have gone at it from a completely different angle. However, they didn’t. Instead, the writer chose to share some common knowledge advice.